At Bridal House and Dressmakers Workshop our main goal is to work with everyone that walks through our door to find or create the perfect gown or bespoke outfit. 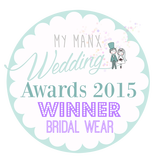 In order to achieve this we edit our dress range regularly and are constantly taking delivery of new styles. Call us to make an appointment to come and view our full collection of discounted Designer Gowns. You can buy from us with confidence knowing that we are authorised stockists of designer wedding gowns and not just a pop up shop selling second hand dresses. What's more is we offer a full service on all Wedding gown purchases, no matter what you have paid..